As long as people have believed in God, there have been those who take the opposing view. The ranks of atheists have always been small, never amounting to more than four percent of the population. The key problem with atheism is that it lacks a strong “selling point.” The followers of this view find purpose in life by attacking the validity of the Holy Bible. Atheists are so opposed to anything linked to God that their hatred gets in the way of common sense. One of their most grievous errors is a cultic fixation with death. I have read the views of several leading atheists and have found an almost universal embracing of death. For them, life is just meant to come to an abrupt end. Biologist, Richard Dawkins, says we have no need to complain about dying because most people will never have a chance to be born. We better complain now, because once we die, we’re no better off than those folks never born. I don’t know of any leading atheists that plan to be cryogenically frozen. According to the game plan medical science will eventually advance to the point where it can revive and restore a dead person to perfect health. These atheists could spend their first few days of new life dancing on the graves of foolish Christians who trusted in a pipe dream. I’ve looked at several atheists’ sites about the subject of cryogenic and they almost universally focus of on the technological obstacles. One saying the $170,000 base rate fee should be used to make this life better. But what should it matter to a billionaire atheist like Bill Gates who could easily spent the money and continue his charity work? If cryogenics failed, it’s not like he’d know the difference. I spoke with theoretical physicist, Lawrence Krauss, at a Las Vegas conference, and he said, “Atheists don’t like to use the word eternity.” Even though the forces in the universe may remain constant for all eternity, they avoid the term because God is too closely associated with it. Atheists go as far as calling eternal life a curse. They argue that life with no end would eventually become boring and unbearable. One atheist said that if he, was allowed into heaven after a few thousand years, the empty perfection of the heavenly realm would compel him to ask God for annihilation. 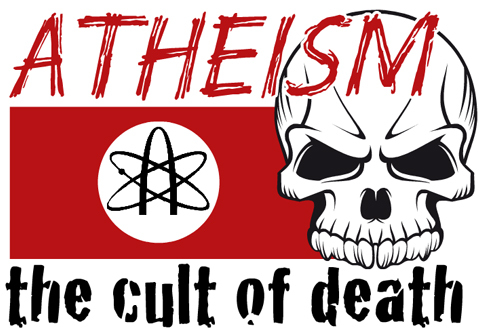 I don’t see the warm embrace that many atheists associate with death. At the end of their lives they would lose everything they achieved in this world. Their loves, discoveries and experiences would all be instantly voided. I can only conclude that the obsession with death on the part of atheists is the result of demonic delusion. Even a godless skeptical mind should know that one of the basic driving forces in nature is the desire to preserve life─at all costs. One thing that helped me remain confident in my faith is the understanding that there are forces dedicated to attacking my beliefs. If God was a lie and there was no life after death, why would people have such a volatile allergic reaction to a message that seems so reasonable? When I see people who blindly embrace death, I see the fingerprints of the one who brought death into this world. “You are of your father the devil, and your will is to do your father’s desires. He was a murderer from the beginning, and has nothing to do with the truth, because there is no truth in him. When he lies, he speaks out of his own character, for he is a liar and the father of lies” (John 8:44). There is hope for people who wish to gain eternal life. The greatest promise made in the Bible is when God said, “I will give you eternal life.” Jesus paid the price of allowing our bodies to become immune to death. In order to receive that gift of immortality, all we need to do is ask for it. “Jesus said unto her, I am the resurrection, and the	life: he that believeth in Me, though he were dead, yet shall he live” (John 11:25, emphasis added). “And this is the record, that God hath given to us eternal life, and this life is in His Son. He that hath the Son hath life; and he that hath not the Son of God hath not life” (1 John 5:11-12, emphasis added).